We can almost hear jingle bells ringing in Dubai, as Christmas is now just a month away! However, we don’t really need to wait until December 25th to start celebrating, because the Christmas festivals have already started in our beloved desert city. Now, for those families who missed meeting Santa Claus at our own Festive Family Fair will still have the chance to see him and join in the festive celebrations during the 2017 edition of the Dubai Winter Festival, which will take place from Wednesday, December 6th to Saturday, December 9th, in Dubai Media City Amphitheatre. 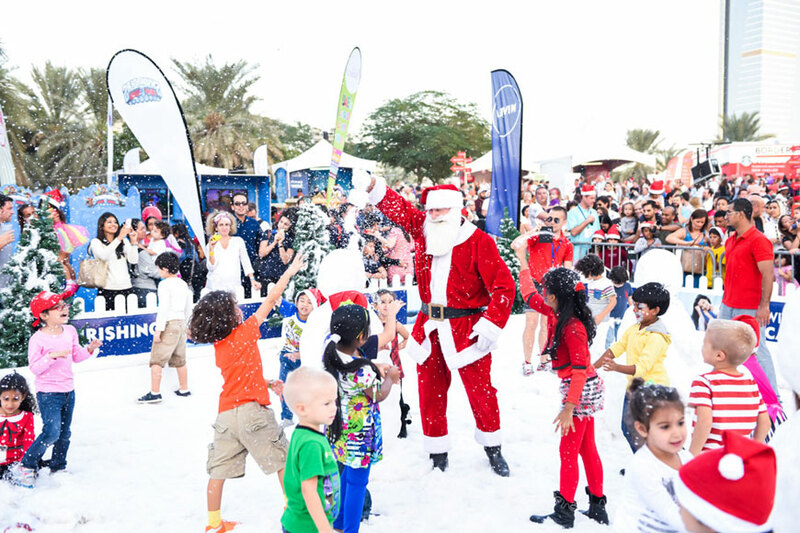 The fun festive weekend returns for its 6th year in Dubai, and it has brought along everything we love about Christmas. As visitors will get the chance to visit Santa’s grotto, shop at the winter market, build a snowman, have a snowball fight, watch the official tree lighting ceremony and much more! Parents to talented and aspiring children can get involved in a talent show which will be open for performers up to the age of 18, on Wednesday only, from 4-6 pm. Each child will get 3 minutes to impress the judges and crowd. And then the judges will announce the winner and prize. This new feature is your little ones’ opportunity to meet their favourite characters, greet, and take pictures with them. Treat your kids to a snow play zone in the middle of the desert city, where they can have a fun snowball fight, build a snowman, and make a snow angel! Build unforgettable memories with your family and loved ones as you watch Dubai’s magical giant Christmas tree brightens up the night sky with a lighting ceremony every evening throughout the festival at 6pm. Keep the little ones entertained in this play zone, where they can indulge in many activities like: human dunk tank, meet a mermaid, arts & crafts, cupcake/cookie decorating, pizza making, and much more. Think of a wish list, write down, and post it a special post box for the elves to deliver to Santa in time for Christmas eve! That’s not it, kids can also meet Father Christmas in person in Santa’s Grotto, as he will be making an appearance in the festival.